El Berraco opened in early 2016 and is bringing a whole new spin on Mexican food. Mexican sea food that is. But it is not just Mexican. 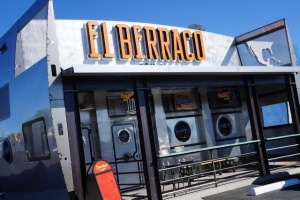 El Berraco is creating Mexican sea food fusion with tastes found along the Pacific Rim. Receipts come from the coastal restaurants from Mexico, California and South America. There is nothing like El Berraco in Tucson or perhaps Arizona. If you are driving on 1st Avenue just north of Grant, you will notice a structure that strikes you as a submarine. A submarine – in Tucson. No “F…n” way! The silver metal skin and port holes will catch you off guard. Could it be the Jules Vernes Nautilus from 20,000 Leagues Under The Sea. The movie of course. As you enter, a dark blue glow of neon lighting surrounds you. No LEDs here. It almost makes you feel as if you are slipping into the depths of a blue lagoon. The interior décor enhances the nautical theme with each scenes on the walls, pictures of submarines and digital fish tank. For those individuals considering themselves “visual”, get ready for sensory overload. If convenience is a factor in selecting a restaurant, then El Berraco is close to the top. Its 1 st avenue location is easy to get to from most areas of greater Tucson. What can you say about a menu? How about “OMG” it goes on forever. Selection after selection. TV’s in the restaurant show tantalizing images of the many dishes available. Seafood dishes reflect the cuisine found from Mexico all the way to Peru. Dishes inspired from Columbia, Mexico and Peru bring fascinating flavors to the sea food. And sea food is more than shrimp and your run of the mill fish. Yes, you will find a lot of shrimp dishes. But how about octopus, sting ray, tuna, oysters, scallops, calamari, crab, swordfish and…. The list goes on! A host of sea food in tacos, tostadas, quesadella, ceviche and other ingenious presentations. El Berraco will meet your seafood cravings. Seafood with unique flavors and presentations from the Pacific Rim. And last, the portions are large to huge. You won’t go home hungry, but you will likely have left overs for tomorrow. On this on lets start with the bad news. It is not a wine bar. There is a selection of wines on the menu, but it is small. El Berraco is for the lovers of beer and margarita. On tap is a long list of options along with bottled beers from Mexico and South America. Someone once said, “you get what you pay for.” And El Beracco is no exception. Yes a bit on the price site, but you can’t find this cuisine any place in Tucson, AZ. And you won’t go away hungry. There are lots of great restaurants in Tucson, AZ. But if you are looking for seafood with a unique Pacific Rim flare – El Berraco is a THE place to go. Great food, lots of beverages and good prices! What more could you want? El Berraco is a one of a kind Pacific Rim sea food restaurant. From the unique décor to the unique flavors influencing each dish. And if you are considering a move to Tucson AZ or perhaps looking of that perfect future place to call home? We can help!